Shirley Ann Maranowicz, age 92 died Friday, January 18, 2019 at Dove Healthcare in Osseo. She was born on July 28, 1926 to Henry Heinze and Margaret Votruba in Oak Grove Township, Barron County. Shirley attended Haugen grade school and graduated from Rice Lake High School. In 1945, Shirley married Edward J. Maranowicz in Milwaukee. 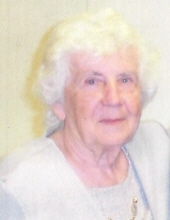 While living in Milwaukee, Shirley was a Certified Nursing Assistant at a nursing home in West Allis. Shirley and Ed moved to Hayward, where they bought lake property on Grindstone Lake. While living in the Hayward area, Shirley worked at the Hayward Hospital. Shirley was a friendly and outgoing person. She loved playing cards with her family, playing bingo and enjoyed going to Deadwood South Dakota. Over the years, she enjoyed keeping in touch with her many friends. She is survived by her sons: Edward “Skip”, Gary (Jill) and Dennis (Karen); 7 grandchildren: Amy (Steve), Dennis (Bethany), Rachael, Melissa (Chris), Victoria (Kyle), Jolene (Jason) and Carrie (Joe); 14 great-grandchildren: Steven, Eric, Madison, Lucy, Frankie, Allyson, Regan, Annabell, Dominik, Brandon, Katie, Miranda, Bo and Jacob; 1 great-great-grandchild Cambrie; sister-in-law Eleanor Heinze; and numerous nieces, nephews other relatives and friends. Preceding her in death are her parents, husband Edward (2004), brother Robert, great-grandson Steven and daughter in law Connie Maranowicz. Memorial services will be held at 1:00 p.m. on Saturday, January 26, 2019 at United Church of Christ, 50712 Main St., Osseo with Pastor Lois Buchholz officiating. Visitation will be held 1 hour prior at the church. Burial will take place at a later date in the Bohemian National Cemetery, Haugen, Wisconsin. To send flowers or a remembrance gift to the family of Shirley Ann Maranowicz, please visit our Tribute Store. "Email Address" would like to share the life celebration of Shirley Ann Maranowicz. Click on the "link" to go to share a favorite memory or leave a condolence message for the family.